The trailer for Vijay's upcoming Tamil film Puli was released on Sunday. The trailer was released a day early, due to popular demand from fans and reported leaks. The teaser of director Chimbu Deven's Tamil movie "Puli", which was released as a birthday gift to Ilayathalapathy Vijay, has received a humongous response from the audience across the globe. Written and directed by Chimbu Deven, "Puli" is an action-adventure fantasy film and the teaser has been creating ripples in the media ever since its release. Vijay has reportedly played dual roles in the film that features an ensemble cast, including Prabhu, Sridevi, Shruti Haasan, Hansika Motwani, Nandita and Sudeep. 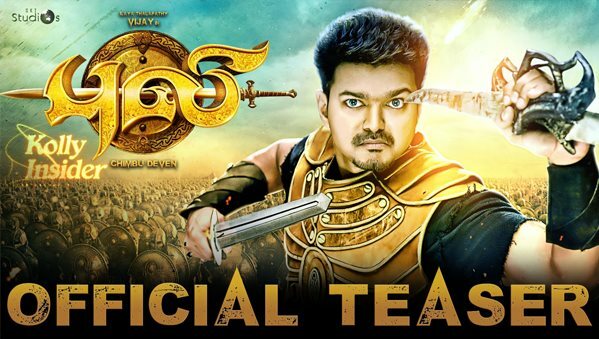 The makers of "Puli" had initially planned to release its first look teaser on Sunday midnight, 21 June. However, they were forced to release its official version on the YouTube channel of Sony Music India after it was reportedly leaked online on Saturday night. Watch the official teaser of Ilayathalapathy Vijay's Puli. Directed by Chimbu Deven, the action entertainer also stars Sridevi, Sudeep, Shruti Haasan & Hansika Motwani in lead roles. Devi Sri Prasad composes the music for this film. The 55-second teaser of "Puli" does not offer much hint at the story of the film, but it definitely gives glimpses into the various lead roles being played by Vijay, Sridevi, Shruti Haasan, Hansika Motwani, Sudeep and others. Besides the action, what impress the most in the video are its stunning visuals, amazing background score, beautiful costumes and art direction. Sridevi is making her comeback Tamil cinema with the Puli. She began her career in Tamil films two decades ago. In Puli, Sridevi will be essaying the role of a mother. She would be playing mom to Hansika Motwani in this fantasy drama that is reportedly along the lines of Russell Crowe's Gladiator. While the roles and the storyline of the film isn't clear, both Vijay and Sridevi are seen making some strange faces. It is likely that Vijay and Sridevi find themselves on either sides of a good vs evil battle. Sridevi's constume is reminiscent of Charlize Theron's from Snow White and the Huntsman. The film, directed by Chimbu Deven also stars Vijay, Sudeep, Shruti Haasan and Hansika Motwani. It is slated to release later this year.